(Chamaedorea elegans)(Neanthe bella) is an easy to care for house plant that will grow in low light conditions in your home or office and in the shade and humidity of summer. I was given a scrawny Parlor Palm that my girl friend gave me in 2014. The palm is still in the same pot she gave to me. I found that the palm loves to be pot pound so do not get in a hurry to repot it. The Parlor Palm thrived in the 65 degrees during the winter in my house in front of the East window. It loves to be outdoors in the summer in bright shade; and that is when it tripled in size. It is easy to care for and as long as it is not in direct sunlight can grow anywhere inside and out. I did not bring in the palm until the nights dipped in the upper 40s which seems to trigger the bloom mode. The Parlor Palm seems to attract spider mites so be diligent about checking for webs and any signs of bug infestation when you water it. If there are any signs of mites, use an organic pesticide or give the plant a shower with some Dawn or Ivory dishwashing liquid mixed in water in a spray bottle and spray the plant with suds. Let sit for a couple minutes and then rinse the plant and let the water run out of the pot. Keep the soil moist but not wet. In the winter the Parlor Palm loved the East window in a 65 degree room where it bloomed in December through early March. The small insignificant blooms turn into very small black seeds that make a popping sound as they are released and usually fly about a foot from the plant. I used rain water and never use tap water unless it sits out for a day or so (to dissipate the chemicals). 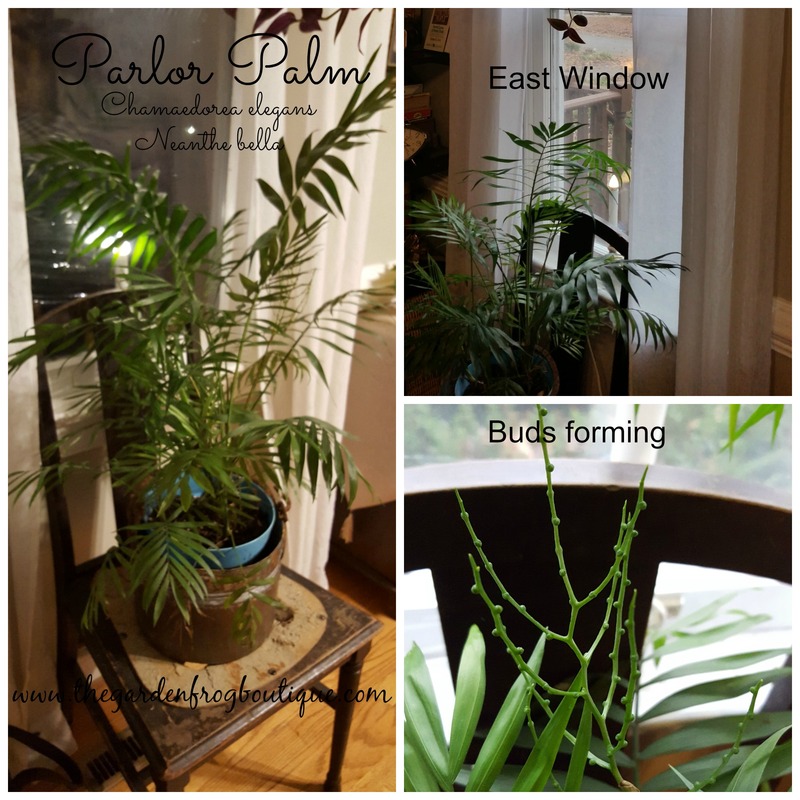 I am so glad you stopped and read about the Parlor Palm.So if you have an unhappy Palm tree even though you are following the instructions, check out what I do and see if that makes an improvement. Let me know if you have any questions and I will help you the best I can.